Magical Fairy Bedding for Your Little Girl! My Favorite Cute Fairy Comforters and Bedding Sets for Little Girls! Are you looking for the cutest fairy bedding for your little girl’s bedroom? What better way to transform your little girl’s bedroom into a magical realm? Young girls love fairies too! They are fascinated by these mythical, legendary creatures and will absolutely love having a cute fairy comforter set! *Yes, this is a glow-in-the-dark fairy comforter! Full of magical pink fairies and flowers with lavender butterflies in a soft lavender background! I found some of the most adorable fairy comforters, blankets, sheets and the cutest tooth fairy pillows! Enjoy your visit, and happy fairy shopping! Don’t forget to sprinkle some fairy dust too! Disney Fairies Floral Adorable Twin Full Comforter Set! Look at Tinkerbell happily flying among the most beautiful flowers with her best fairy friends! Your little girl will have the most magical fairy dreams every night! It also has pictures on both sides, so you can switch looks! It is also super soft and just perfect to start creating a fairy bedroom for your daughter! 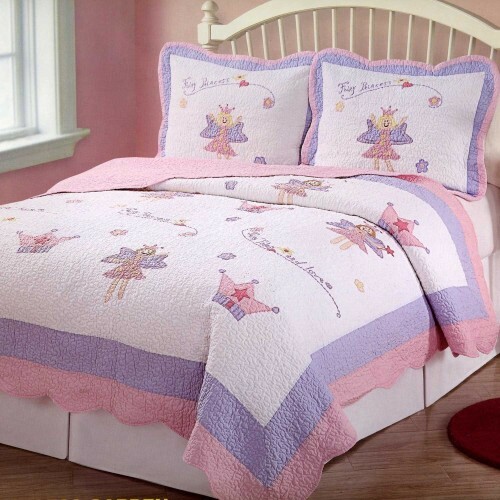 Of course we cannot talk about cute fairy bedding without including a gorgeous Tinkerbell comforter set in the mix! After all she is the most famous fairy around! Every little girl dreams of being Tinkerbell! Now your little girl will have her very own Tinkerbell comforter set to fly away in beautiful dreams every night! It is perfect for a 3 or 4 year old little girl’s bedroom! 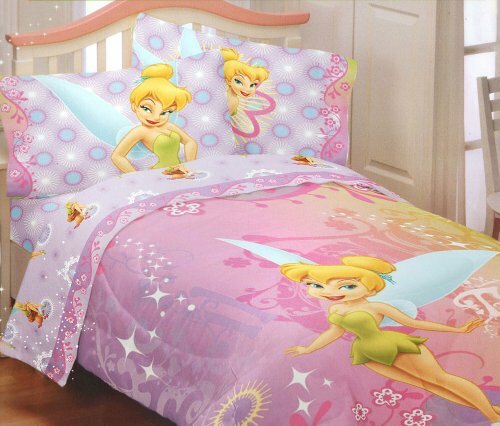 Besides the cute Tinkerbell comforter you will also get one cute Tinkerbell pillow case and one fitted sheet. Cutest Fairy Bedding for Girls! I am in ‘pink fairy heaven’ right now! She loves the color PINK! She is also a happy fairy that can’t wait to take your little girl to the most wonderful dream places at night! This is a full size comforter set that comes with two shams, two pillow cases and two sheets! The comforter is also reversible! Beautiful Night Fairy Playing Flute Duvet Cover! What a beautiful and truly magical night fairy playing her magical flute duvet cover for sale! Perfect ‘fairy gift idea’ for a teenage girl fairy lover! It is magically soft and warm! Stunning Fairy in the Meadows Fleece Throw! 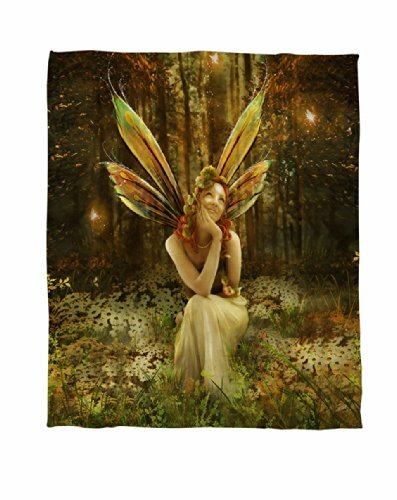 What a stunning magical winged fairy in a gorgeous meadow fleece throw for sale! This is the most beautiful fairy blanket I have ever seen! How gorgeous are her fairy wings? It’s very soft, thick and heavy! If you are looking for the cutest Tinkerbell comforters for your little girl, I think you are going to love this adorable PINK Tinkerbell comforter for sale! It’s not only magically gorgeous, but also extremely soft and comfy! What a lovely pink and purple fairy quilt! With cute dancing fairies, pink hearts and flowers and crowns! It’s made from 100% cotton! It also comes with one cute fairy pillow sham! Best Fairy Comforters for Girls! 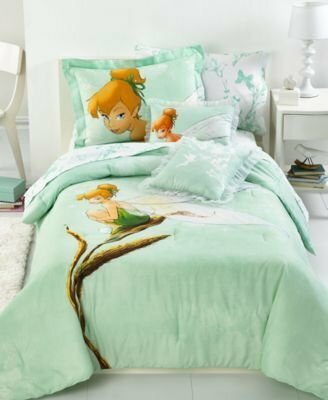 This is one of the most beautiful Tinkerbell comforter sets I’ve seen! What a gorgeous aqua color and unique design! Just perfect for your little fairy-loving girl! This is one of the most adorable fairy blanket and sheet sets ever! It’s a beautiful and rich turquoise Disney fairies and butterflies bedding set! It comes with two sheets, one blanket and one fairy pillow case! Now it’s time to add some cute plush fairies on the bed! How gorgeous is this plush fairy doll for sale? She also loves all the trees and the Earth! She loves to dance in the air! What a fun fairy gift idea for any little girl! Perfect to take when traveling! This is the best fairy pillow ever!! It’s a Tinkerbell cuddle pillow! Can you imagine your little girl’s face when you give her her very own Tinkerbell? She will never let go! She is ultra-soft and perfect for cuddling with anywhere and everywhere! I want one to put on my couch! 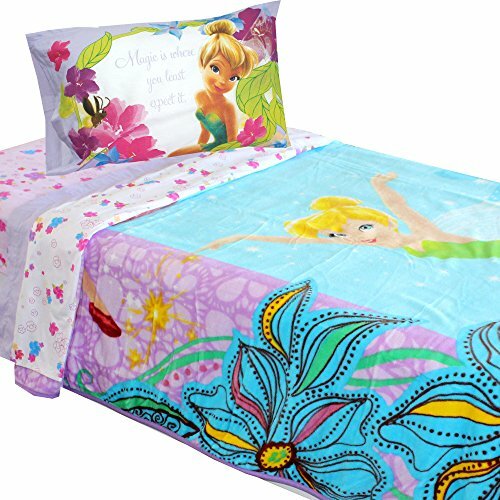 Cutest Disney Princess Bedding Sets for Girls!